(Nanowerk News) If you can't find the ideal material, then design a new one. 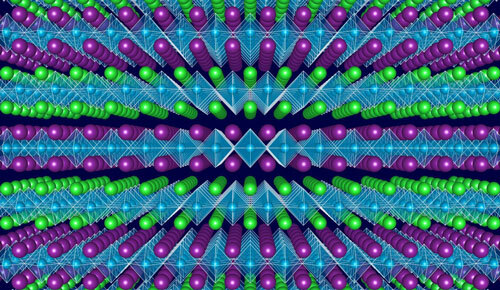 Northwestern University's James Rondinelli uses quantum mechanical calculations to predict and design the properties of new materials by working at the atom-level. His group's latest achievement is the discovery of a novel way to control the electronic band gap in complex oxide materials without changing the material's overall composition. The finding could potentially lead to better electro-optical devices, such as lasers, and new energy-generation and conversion materials, including more absorbent solar cells and the improved conversion of sunlight into chemical fuels through photoelectrocatalysis. "There really aren't any perfect materials to collect the sun's light," said Rondinelli, assistant professor of materials science and engineering in the McCormick School of Engineering. "So, as materials scientists, we're trying to engineer one from the bottom up. We try to understand the structure of a material, the manner in which the atoms are arranged, and how that 'genome' supports a material's properties and functionality." The electronic band gap is a fundamental material parameter required for controlling light harvesting, conversion, and transport technologies. Via band-gap engineering, scientists can change what portion of the solar spectrum can be absorbed by a solar cell, which requires changing the structure or chemistry of the material. Current tuning methods in non-oxide semiconductors are only able to change the band gap by approximately one electronvolt, which still requires the material's chemical composition to become altered. Rondinelli's method can change the band gap by up to 200 percent without modifying the material's chemistry. The naturally occurring layers contained in complex oxide materials inspired his team to investigate how to control the layers. They found that by controlling the interactions between neutral and electrically charged planes of atoms in the oxide, they could achieve much greater variation in electronic band gap tunability. "You could actually cleave the crystal and, at the nanometer scale, see well-defined layers that comprise the structure," he said. "The way in which you order the cations on these layers in the structure at the atomic level is what gives you a new control parameter that doesn't exist normally in traditional semiconductor materials." By tuning the arrangement of the cations--ions having a net positive, neutral, or negative charge--on these planes in proximity to each other, Rondinelli's team demonstrated a band gap variation of more than two electronvolts. "We changed the band gap by a large amount without changing the material's chemical formula," he said. "The only difference is the way we sequenced the 'genes' of the material." Supported by DARPA and the US Department of Energy, the research is described in the paper "Massive band gap variation in layered oxides through cation ordering", published in the January 30 issue of Nature Communications. Prasanna Balachandran of Los Alamos National Laboratory in New Mexico is coauthor of the paper. Arranging oxide layers differently gives rise to different properties. Rondinelli said that having the ability to experimentally control layer-by-layer ordering today could allow researchers to design new materials with specific properties and purposes. The next step is to test his computational findings experimentally. Rondinelli's research is aligned with President Barack Obama's Materials Genome Initiative, which aims to accelerate the discovery of advanced materials to address challenges in energy, healthcare, and transportation. "Today it's possible to create digital materials with atomic level precision," Rondinelli said. "The space for exploration, however, is enormous. If we understand how the material behavior emerges from building blocks, then we make that challenge surmountable and meet one of the greatest challenges today--functionality by design."